I amble upstairs and pick up the phone and it read’s “MEGA Norfolk Empidonax flycatcher (probably Alder, Willow or Least) Blakeney Point in Plantation at 1:05pm. Approach with caution” . My heart starts thumping, Kim’s starts giving me chores I don’t really want right now. I settled for just dragging a mattress, single-handedly into Georgies room, for her impending sleeping over Cousins. I then charge downstairs for my wallet, then charge upstairs for warm clothes, then charge downstairs for car keys, then charge upstairs for my camera, then charge downstairs for my notebook…Quite honestly I’m bloody useless with same day twitching. Will I ever be more organised and have a pre-packed bag in the car boot? I doubt it..I’m a man for god sake. I left the house at 1:15pm and the first stop was Tesco fill up . Whils’t filling up, my mind was calculating an E.T.A. The Cley to Blankeney Point walk takes at least 1.5 hours, the Cley journey is between 3 to 4 hours depending on traffic. Therefore my E.T.A. is at worse 6:45pm and the bird will be getting ready to roost by then. If I dip I can always stay the night. On route Brighton John wanted me to wait an hour for him to get to mine and Chris was hoping I could go clockwise around the M25. I arrived at Cley at 4:30pm. I take one step out of the car, and soon realised I forgot to bring my coat, gloves, hat and ruck sack. Never mind atleast I had a spare T-Shirt in the boot. And by god, did I need it. The 3 mile walk was absolutely horrendous. The route to the point was mainly on shingle, with hail stones/ rain, 30mph westerly gales in your face for the whole journey .If you didn’t have enough energy to propel yourself forward, the gale would have taken me back to the car park without me having to lift my legs. I considered returning to the car more than once.. I assure you. But this is supposedly a “Yellow-bellied Flycatcher”, a first for the Western Palearctic, I had to keep moving, even if it meant conserving energy by moonwalking ("Michael Jackson style" )every now and then...I was still overtaken by many fit birder racing each in wheelchairs and roller skates. On route to the point I can bearly make out the birders leaving. I’m sure I spotted James Hanlon, Richard Millington, Neil Alford, Lee Greogory , Adrian Kettle all leaving with big grins. I got to the point at 5:45pm and 10 minutes later I connect with this Empidonax sp. I notice the double white wing bar, typical flycatcher upright stance, lemon coloured throat and belly, and then it hops right (just about still see it, but crap views), and then hops right again and this time out of sight. I take a look for the first time to see who’s at the twitch. Most birders are sitting on a raised bank, looking down in the compound. But one twitcher is looking in the opposite direction. Infact, he is laying down and looking up the hill, at the very friendly Penny Clarke (it reminds me of old Cadbury’s Flake adverts). However the images, she obtained will undoubtedly prove vital in clenching the Flycatcher true identity. It was quite easy to spot me at the twitch. I was the one with the "RED HAIR". No It wasn't red die... the bank was so slippery and when someone called they had it... I rushed over...I slipped on the damp bank....and before I knew I was laying on my back with my Manfrotto tripod, now newly attached to my head. After a few minutes the bleeding stopped and news of a "Northern Parula" broke. 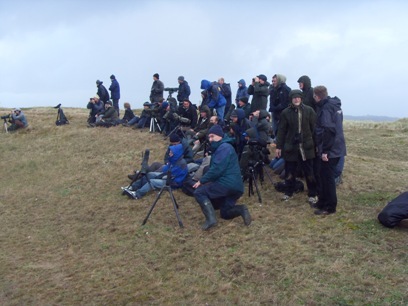 One group of twitchers present, immediately organised a next charter to Tiree. I left the point at 18:30 and got back to the car around 20:00. Whilst in the car I tried to use my mobile phone, but this had got soaked and I wasn't able to rmake/ receive a call or send/ read a text. I took it apart and tried to dry it, then the battery went flat. The plan was now very clear, no team, no phone; therefore it was time to head back home. At Fakenham, I popped into a chip shop and there before my very eyes stood LGRE and his friend Alan. He said "I've been trying to get hold of you, John Bell as reserved you a seat for a boat leaving Oban at 9am tomorrow morning". Initially I wasn't interested, but after putting Oban into the Sat Nav and finding out that I could be there at 6am Sunday morning, which would give me a safety margin of 3 hours to get there., I cracked and decided to go. I left Fakenham at 21:30. The sat nav took me through a few back roads, but it eventually got me on the A1. At Scotch Corner, I came off on and went onto the A66, then to the more familiar M6. I arrived at Oban at 6:30am. I parked up at the Columba Hotel and John arrived there at 7:45am on foot. At 8:13am, the people of Oban might have spotted me hugging John. Don’t worry I’m not bi or gay . I did, what I did because the pager just confirmed the best news in the world, “The Parula is still present for its 2nd day”…..wow…what a feeling. Before this message, there was every chance that my sleepless night was to become a whole lot worse, I might have to start driving home. We drove to the ferry terminal, and attempted to get the car booked on the Sunday ferry and returning on the Monday. No problem getting out, but couldn’t bring car back to Tuesday. This forced us to go as foot passengers (£16.70 return each, where ticket was open for a month). Oban is full of pay and display car parks. But if you ask John nicely, he can draw you a map on where there is free parking, The car park is only a 20 minute walk from the Ferry Terminal. The Ferry departed on time at 9:00am. John and I tucked into a reasonably priced cooked breakfast on the ferry. The crossing is due to take 4 hours. During the cruise, John attempted to organise transport from Terminal to the Bird and accommodation for the night. Well bless his cotton socks he did try. John has got nearly every useful Tiree number stored on his mobile. 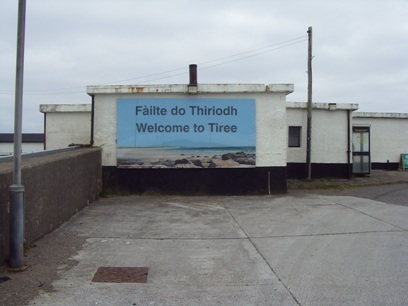 Numbers including:- Tiree Ring’n’Ride number (01879-220419)(doesn’t operate on a Sunday), Car hire MacLennan Motors (01879-220555) (also closed on a Sunday) and John Kennedy Taxi (01879-220419) who didn’t answer the phone. 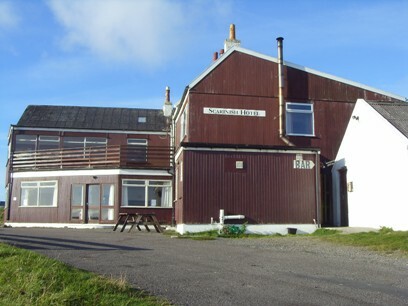 John also tried to book us in at the very cheap Millhouse hostel that sleeps 16/18. They were also closed.(01879-220435). In the end, Angus Murray kindly laid on some transport. 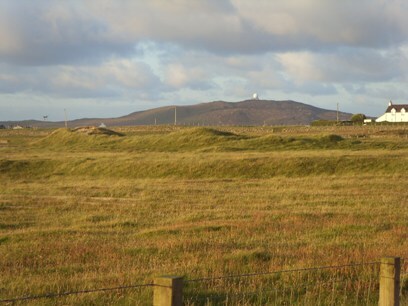 Angus flew onto Tiree with 6 others on a charter plane. The minibus that chauffeured them around on the Island was sent to pick us up at the Ferry port once Angus was airborne again. During the crossing I spotted an immature White-tailed Eagle flying alongside the Ferry and just above the sea. This was very impressive indeed. The Ferry docked at 13:00 and 15 minutes later the Minibus arrived. The driver whisked us to John Bowler’s house (11 miles away), and only charged us £11 for the privilege. John Bowler greeted us on arrival and led us into his beautiful house. We took our shoes off, but I probably left a trail of Blakeney sand & shingle from his front door to his living room window. The bird was immediately showing, just outside his window feeding low down on a very small Sycamore. I believe this is the first rarity I’ve ever seen through a living room window. John rang out the news and shortly after ,John phone was continually ringing. I counted 500 phone calls during the day. He must have lots of friends! It transpired that most calls were from the President of the UK400club asking some very important questions. Questions ranged from:- Have you seen it yet? Where? When? How? Who’s there? What’s the bird doing? How much did it cost ? Has Bagnell changed his underpants yet? Before anybody asks "Did I take this photo?" Tthe answer is no it was taken by the finder "John Bowler". John Bowler is a great guy, he told us that he wanted to call his house on Tiree“ Parula” after the one he saw on the Scillies in 1992. His wife Janet says “You can only re-name it, if you find one”. 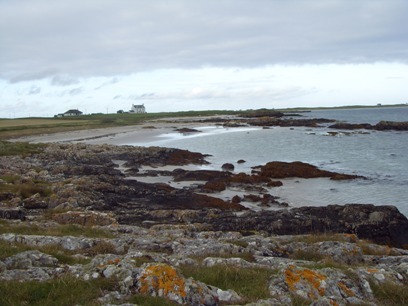 John has now been living on Tiree for 10 years and now he has found one…the big question is….will Janet let him? We left John’s house at 16:00 and did some birding in the general vicinity. Best birds included Whooper Swans & a Greenland Redpoll. About 18:00, we made our first attempt at thumbing a lift. It was an instant success. A car stopped, we both jumped in and we shared the back seat with a couple of dogs (no, not ugly women). The driver knew where there might be a vacant B&B…and bingo we went to Crossapol and met Marion Campbell and I simply made a Coffee then crashed out on the single bed. On the Monday morning, John & I get up just before 07:00 and tucked into the sumptuous breakfast Marion had prepared for us. We left the B&B at 08:00 and decided to walk the 3 mile stretch to Scarinish. The Ferry arrived at 12:30 and departed shortly after. I very rarely see any hot totty on Caledonian MacBrayne ferries... But this ferry was full of them! One in particular was wearing knee length leather boots and wearing a tight fitting white T-shirt. I’m certainly glad Kim has not got this type of T-Shirt, as nothing is left to your imagination. One balding lad with red hair, kept staring at the girls beautifully formed love buckets…in the end…the poor lass had no choice but to turn around,, so no more viewing were possbile for the rest of the crossing. The ferry docked at 16:30 and I suppose I am glad I didn’t spend £450+ on this occasion. But good luck to the crews that plane charter, they are mega keen and certainly deserve the birds. I got home at 2:30am Tuesday morning. Drove 1181 miles. and trip cost (excluding food) was £234. Approx £181 (Parula) and £53 (Alder Fly). 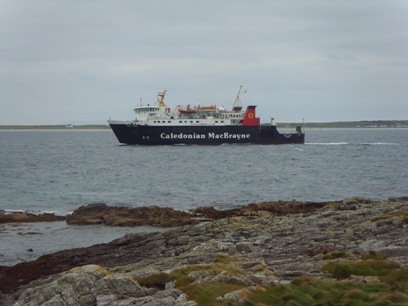 The Caledonian MacBrayne ferry operates daily, between Oban and Tiree. Thursday is the only day you can day trip it. Once ferry has docked it would not be possible to drive the 22 mile round trip and get back on the same ferry. Ferry only stays docked in the region of 20minutes. 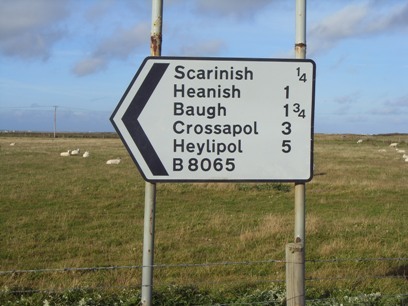 I didn't see many sign posts on Tiree, so I couldn't resist taking this photo. 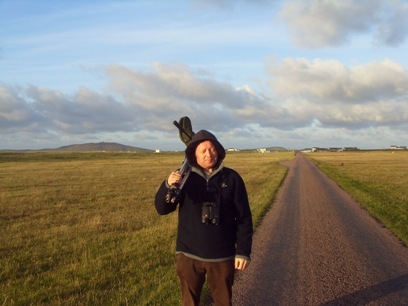 I enjoyed some early morning birding between Crossapoll and Scarinish. (3 mile walk). Note all the roads on Tiree are single carriageway, so thumbing a list is always a possiblity. 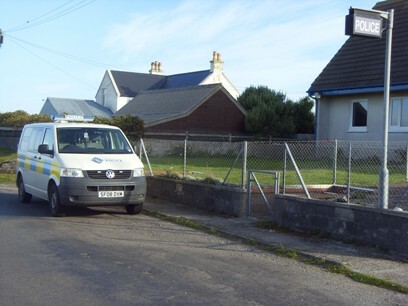 The only police station (Scarinish), I do hope no twitcher needs to go in the slammer for the night. Another nice place to stay, but sadly 11 miles from the Bird. 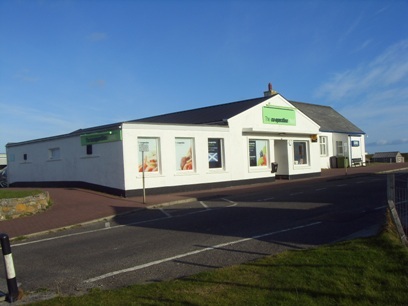 Not many shops on the Island, but this Co-op store located in Scarinish should be worth a visit. 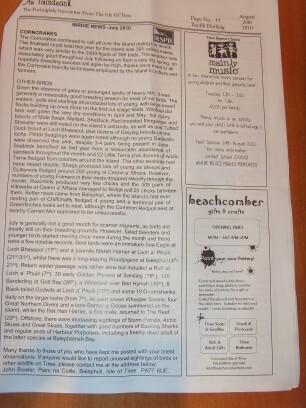 An extract from the Fortnightly Newsletter "An Tinisdeach", in which the finder "John Bowler" writes his Birdie news.